New car reviews, news and car buying information since 2008. The 2018 Alfa Romeo Guilia Ti Lusso Q4. Publisher's note: Normally, the cars you read about here at TireKicker are loaned to us by the press fleets of the various manufacturers for several days. Seven is typical. Occasionally, we'll get a longer period of time, and sometimes it'll only be three or four days. Our "30 Minutes With" series features cars we spent half an hour driving during the just-concluded Western Automotive Journalists Media Days in Monterey, California. 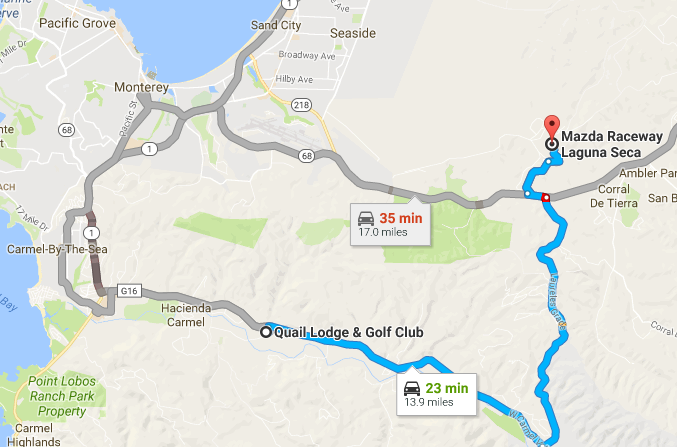 Day one of Media Days is a driving program, with journalists taking cars from the staging area at Quail Lodge in Carmel Valley to Mazda Raceway Laguna Seca via Laureles Grade. Once there, you swap cars with another journalist for the drive back, get a different car at The Quail, and repeat. Apart from an hour's lunch (this year sponsored by Nissan), this is the day from 9:00 a.m. until 4:00 p.m., although heavy rains forced us to call it a day at 2:30 this year, reducing the number of cars we could drive. Twenty-one years of professional TireKicking (I reviewed cars on TV and radio before launching TireKicker in 2008) have put me behind the wheel of just about every make of automobile available in the USA. One of the few that I'd never driven is an Alfa Romeo. Alfa left the U.S. market in 1995, two years before I began writing about cars. And while they've been back for four model years now, I've never been booked in one from a press fleet. Enter Media Days 2018. The 2018 Alfa Romeo Guilia Ti Lusso Q4 became car number three for the day, on the one-way run from the Quail Lodge to Mazda Raceway Laguna Seca. Quail Lodge to Mazda Raceway Laguna Seca via Laureles Grade (map courtesy Google Maps). Laureles Grade is about five-and-a-half miles of non-stop twists and turns between Carmel Valley Road and CA 68, and thus perfect for a pack of automotive journalists and some high-grade machinery. 2018 Alfa Romeo Guilia Ti Lusso Q4. The Guilia was introduced for the 2017 model year, and after reading raves about what it's like to drive, I'm happy to report that it's all true. The Guilia is a BMW competitor, but more than that. It competes not only with what BMW is building today, but also with what BMW built before that lingers in the memory: Simpler, more direct machines that make the driver one with the road. 2018 Alfa Romeo Guilia Ti Lusso Q4 interior. While luxurious, the Guilia isn't dripping in gadgetry. You sit down, look around you and you see a very nice place from which to do the business of driving. The Guilia Ti Lusso Q4 base price is $44,695. For that, you get a two-liter four-cylinder engine that makes 280 horsepower, which Alfa says is capable of 0-60 in 5.1 seconds. I believe them. What numbers can't tell you is just how good this car is on a winding road like Laureles Grade. The car had no window stickers in the glove box when I drove it, making it impossible to discuss optional equipment with any certainty but I've found another review of the same car (based on its license plate) that shows a bottom line of $51,490. That's right in the ballpark for a well-equipped BMW 3 series these days. The Media Days drives are the automotive journalism equivalent of speed dating. I'd like the chance to get to know Guilia better. Hopefully, Alfa's listening and willing to play Cupid for a week sometime soon. TireKicker is a proud member of Western Automotive Journalists. Click the logo for more information. TireKicker and its contents Copyright 2008-2018 Michael Hagerty. Awesome Inc. theme. Powered by Blogger.